As the Prem Tinsulanonda School (Prem) is very active in joining forces with students from around the world and educating young adults to become global citizens, Simon Greensdale, the asst. director of the Visiting Schools Program invited students of Brigham Young University (BYU), their teachers and chaperones, to experience a ‘real’ Northern evening. 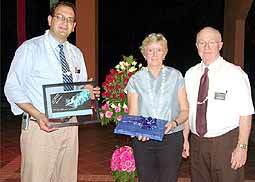 Davidene Hannah, director of admissions at Prem Tinsulanonda International, received tokens of appreciation from JonathonWood on behalf of the BYU and from Hal J. Allen, Asia Area public affairs manager of the Church of Jesus Christ of Latter-Day Saints. For the young American university students it was a feast and new experience. Sitting on the floor, sweet smelling flower garlands around their necks and having a meal served on low, circular tables (or tok). Fresh vegetables, sticky rice, fresh fruits and traditional Northern Thai dishes. Before the Victory Drum dance starts, the drummer must first pray to thank his teacher and his teacher’s teacher and his teacher before that, and so on. When the drummer begins, however, you can see the result of his training as he uses every part of his body to hit the drum. 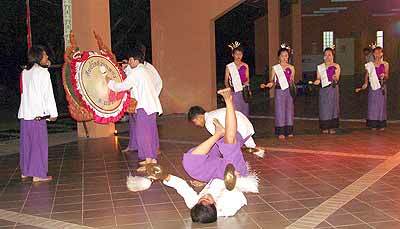 To round the evening off, another youth group from Baan Nongplaman entertained the American guests with Northern Thai dance and music, which their leader, Leung Noi, works tirelessly to preserve. MC of the evening Cheryl Penney gave interesting and educational facts on the different performances. To get the guests in the mood, the Thai dancers started with a ‘Mong Seung Drum Dance’, which was the leader and trainer Leung Noi, accompanied by a lone cymbal player, followed by beautiful female candle dancers and rounded off by the Victory Drum Dance and the high tempo sword dance, which was as noisily enthralling as it was dangerous looking. After fireworks and lanterns, the guests, hosts and Chiang Mai folk agreed it provided the perfect opportunity to get the “western” visitors acquainted and familiar with traditions and habits of Northern Thailand. 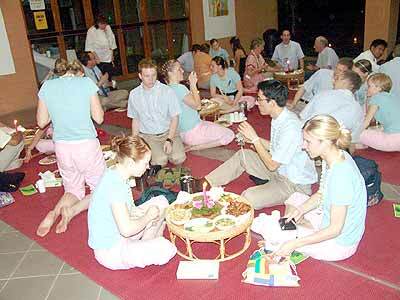 For all of the American students from Utah it was the first experience of a Kanthoke Night. Nakarin Chaikla (aka Kroo Nut), with a team of dancers from Voice Studio entered the “Ching Den Ching Dang” dance contest organized by Kai Warayute Milinthachinda, drama provider of TV channel 3. Voice studio dancers win a dance contest. Two stars, Nithi Samoodkhojorn and Yanee Jongwisute, acted as MC’s. Voice Studio performed in the style of a Chinese fighter, choreographed by Kroo Nut, and three unusual instruments were used in the performance, namely an insulated container of hot water, a banana tree and child’s mosquito net. 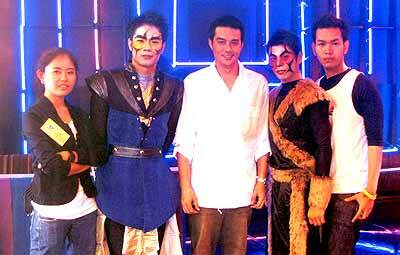 Kroo Nut modified the show from a Mulan movie as a musical performance entitled “Mulan enjoyed with music” and a dance to a song called “I will make a man out of you”. Our local Voice Studio won the contest, and Channel 3 will air the recording of this performance on May 22 at 12.45-1 p.m. The Chiang Mai Ballet Academy welcomed the dancers from The Dancer’s Company, Utah, USA at a workshop held to exchange expertise and information about dance techniques between both dance institutes. From left: American coordinator Jonathan Wood, artistic director BYU Rebecca Wright, Michelle Nielsen and M.L. Preeyapun Sridhavat, director of Chiangmai Ballet Academy. “This is a good opportunity for Chiang Mai residents to see Modern Dance and we have planned to send some of our good dancers to learn dancing in America,” said ML Preeyapun Sridhavat, director of Chiangmai Ballet academy. Phusit Kornsurin, Payap University’s director of IT, revealed that Payap University has planned to implement high speed internet and increase its capacity from 100 megabyte to one gigabyte. It would also support a digital library system to use VDO conference, VDO on demand and E-learning. The methods to improve their network system combine uni-net and Chiang Mai internet from 4 megabytes to 8 megabytes, linking to other networks. The system will be continually improved and more telephone lines (VPDN) will be added so that Payap’s students can have access throughout the country by dialing 1222. Maybe it was the holiday season, but both APIS campuses were hives of activity with Summer Programs in March and April. At the Kindergarten, 30 students worked in two groups and they all had fun learning languages and experiencing different cultures. 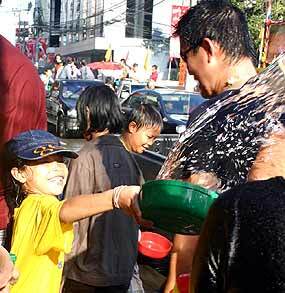 They especially enjoyed “Songkran”, the traditional New Year of Thailand, where we all are now. 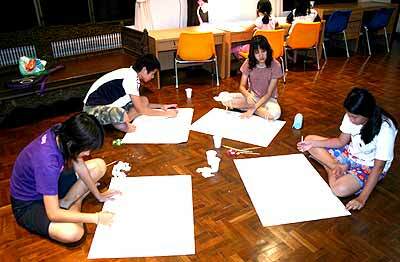 Team building games for the visiting groups from Thailand, Korea and Japan. The first group of 13 students, aged from 2 to 4 years, or ‘blue group’, worked on the theme “At the sea” ‘ with their South African teacher and two assistants. Through creative and stimulating activities, the children became aware of what we find under the sea and on the seashore, covering topics such as ‘sea animals’, ‘a day at the beach’, ‘colors and shapes found at the sea’ and ‘safety first when visiting the sea’. The children were encouraged to explore new aspects of themselves through art classes, music, dance and creative play time. Their language skills and vocabulary were stimulated at all times and especially through story time and group activities. The most memorable event was during the second week when they all learned how to “Lod Nam Dam Hua” their teachers. The second group, the ‘red group’ worked on the theme “Around the world” focusing on different countries around the world and their cultures. Each day, the students enjoyed listening to stories of each country, finding out about typical foods and art work from around the world. During the lessons, the students were asked questions such as, where is it? Who lives there? What languages do they speak? What kinds of foods do they eat? What kind of clothes do they wear? What are some interesting places to visit there? Two fieldtrips were included the program: Wat Doi Kham, a famous site in the local area, and to the Doll Museum where they saw dolls being made and viewed the collection of dolls around the world. The most memorable event was during the second week where they all learned how to “Lod Nam Dam Hua” their teachers. After the ceremony, they changed into swimsuits to play. Everyone got very wet! Up on the hill, the home-stay houses on the main boarding campus became the residential base for thirty-two visitors aged 7-15 from Thailand, Korea and Japan. During the day, students learnt, and practiced using, English, developed their skills in the use of computers and learnt how to work together in teams. Rock-climbing, making souvenirs from sa-paper, shopping at Ban Tawai and at the Night Bazaar gave an insight into the attractions and crafts of our local area, while the opportunity to celebrate Songkran in Chiangmai was unforgettable. It has been many weeks since Chiang Mai has had a good, long soaking rain. So when the PTA began organizing this year’s Yard/Car Boot Sale, Saturday May 7 seemed like a good idea - then the night before, the rains came - we figured it would stop - but it seemed to rain for 24 hours! With the 3 x 2 meters spaces all marked off in the huge elementary yard, the PTA felt ready for the crowds. But not the rain! Instead of the huge yard, the sellers moved into the hallways. Special thanks to Jenny G. for giving us permission to move everyone onto the covered hallways of the new building. The Garage Sale covered the first two floors! Dean Overholt ran around measuring spaces for everyone and finding electricity for the 9th graders. In spite of the last minute change in plans, the sellers were very helpful and cooperative. This caused a 15 minute delay in opening the gates, but everyone seemed willing to wait. Adults paid 20 baht to enter and students and children were let in free. 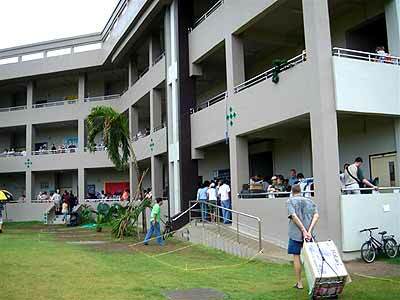 The sellers paid 300 baht to sell with all the money going to the class of 2006. About half goes to the Senior trip and the other half will be used for senior scholarships, as has been done for two years now at GIS. In spite of the rain, many folks came from international schools here and the community at large. There was ice cream and soft drinks sold by the 10th grade class. There was coffee and cinnamon rolls sold by the 9th grade class. From furniture to computers to books to clothing to games and toys, there were treasures changing hands all over the place! There was homemade apple butter and jams and cats and guinea pigs all for sale and ... well, it was fun! “This yard sale is the 4th I have helped coordinate; it was disheartening to see the rain, but the cooperation and good nature of everyone really helped make the day a success. Even the cleanup was the easiest so far! Thank you to everyone!” said Ada Breeding-Overholt, current president of the Grace PTA. Thank you to all who participated! Thank you to the administrators, the families and friends and everyone who contributed to this day! See you again in early November for the next GIS Garage Sale.